Marnie loved Jeff once, but can she remember how? A car accident has left Marnie Jordan with amnesia, and several years of her life are lost to her forever. Jeff, her husband of six months, is devastated by the fact that she doesn't remember anything about him, their marriage, or their plans to become missionaries. Worse yet, she doesn't even remember her relationship with the Lord. Despite Jeff's devotion throughout her recovery, Marnie begs him for an annulment. Then his mother-in-law suggests the unimaginable-that he move out and begin courting his wife as if they had just met. Can Jeff win Marnie's heart all over again? Or are their hopes and dreams gone forever, like Marnie's memory? 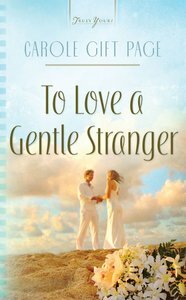 About "Heartsong: To Love a Gentle Stranger"
Page is an award-winning author, writing instructor, and conference speaker. She and her husband founded the Inland Empire Christian Writer's Guild.